In this article we are going to cover How to Find Cumulative IO Stats. How to Find Cumulative IO Stats? 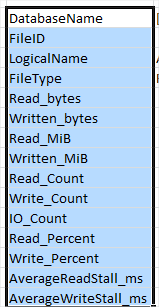 This script will show the amount of IO that has been done for each database file. As well as this it will show the read/write work load split as well as showing what sort of wait times you have for each io request type. An important aspect to note with this particular data is that the values are transient in that a server restart for example will reset them. INNER JOIN sys.dm_io_virtual_file_stats(NULL, NULL) iovfs ON mf. Hope you will like How to Find Cumulative IO Stats.